Final VI for 'Alice in Wonderland'. External advertising, printed material, digital assets, online micro-site game and photography shoot. Original concept presented to the Playhouse: a darker, more menacing feel where Alice is caught between confusion, illusion and a dreamlike state. 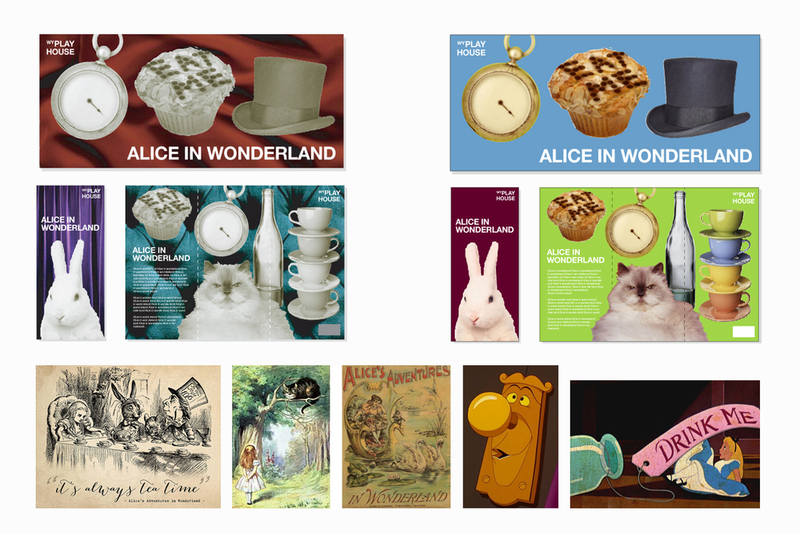 Final VI produced for 'Alice in Wonderland', West Yorkshire Playhouse. I was invited to WYP on a consultancy capacity to advise and concept the branding for their major end-of-year production. The in-house designers were struggling to adequately conceptualise the campaign and their hard-deadline was fast approaching. I returned within the week with initial concepts where the recommended option - focusing on the surreal nature of the storyline - was approved on the spot by Ian Brown (Artistic Director and Chief Executive, 2002 - 2012). In charge of all aspects of the project and management of the in-house team for the production period, I also oversaw outsourced elements such as the viral marketing game 'Jump Alice jump'. I personally sourced the location for the shoot (Levens Hall, Cumbria), briefed the photographer and Art Directed the 8 hour photoshoot on-site.